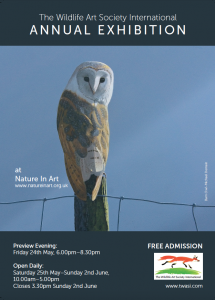 The Wildlife Art Society International’s annual exhibition of wildlife art. Around 300 paintings, drawings, original prints, photogrpahs and sculptures by professional and part-time members of this active organisation will be on display, the majority for sale. Members will be demonstrating throughout the exhibition.